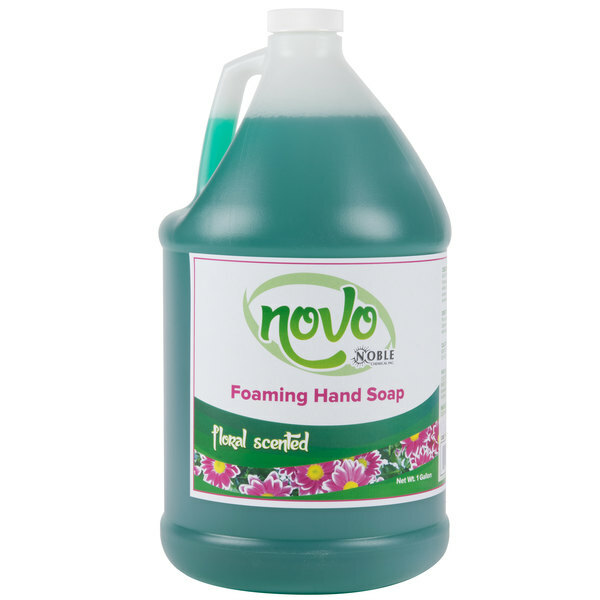 Featuring a pleasant floral scent, this Noble Chemical Novo 1 gallon foaming hand soap will wash away dirt and grime and keep your hands clean! This thick-lathering formula is gentle and mild for soft skin, yet removes soils and greases for effective cleaning. It is specially-formulated with grease-cutting agents and pH neutralizers to provide a deep clean without irritating the skin. This mild, scented soap ensures a quality clean and rich, foaming lather in hot or cold water. Easy-to-use in your foaming soap dispenser, this hand soap comes in a bulk 1 gallon container to keep your facility in good supply. Simply pour the soap directly into the liquid foaming soap dispenser, dispense soap into your hands, and rub hands together to cover them entirely with the foam soap solution. The foaming soap is biodegradable, environmentally-friendly, and gentle on hands to help prevent dryness and irritation. Stock up on this Noble Chemical Novo 1 gallon foaming hand soap to ensure clean and sanitary contact with foods, kitchen tools, housekeeping items, and more! All content copyright © 2006-2019, Noble Chemical Inc. All Rights Reserved. Noble Chemical Inc. is an equal opportunity employer.